Angling northeast from Wichita Falls, Texas to St. Louis, Missouri, Interstate 44 connects the southern Great Plains with the Upper Midwest. Three sections through Oklahoma take toll roads including the H.E. Bailey Turnpike from U.S. 70 near Randlett to Lawton and again from Lawton to Oklahoma City. The Turner Turnpike extends I-44 east from Interstate 35 near Edmond to Sapulpa southwest of Tulsa. The 1950s-built Skelly Drive takes Interstate 44 east across Tulsa to the Creek and Will Rogers Turnpikes by Catoosa. The Will Rogers carries the remainder of I-44 through Oklahoma to the Missouri state line by Joplin. 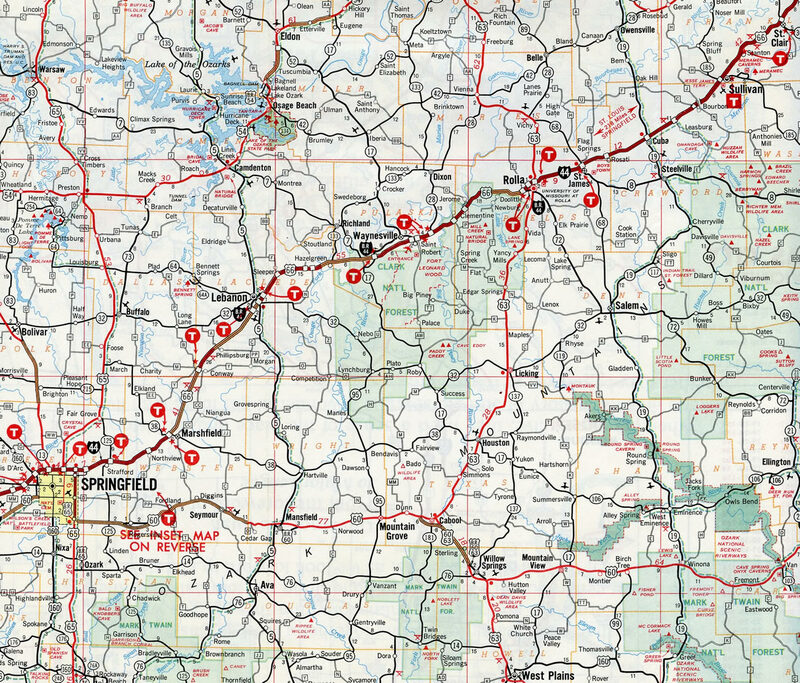 Throughout Missouri, Interstate 44 overlaid or parallels Historic U.S. 66 as it travels east to Springfield and northeast to St. Robert, Rolla and greater St. Louis. The eastern extent combines with I-55 north to the Poplar Street Bridge, where it formerly turned east and ended along side Interstates 64 and 70. 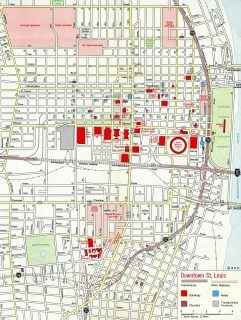 A slight extension was made in 2015 over what was I-70 by the Gateway Arch and Downtown to the newly opened Stan Musial Veterans Memorial Bridge. CREEK TURNPIKE, OKLAHOMA.-The Secretary shall designate as part of the Interstate System (as defined in section 101 of title 23, United States Code) in accordance with section 103(c)(4) of such title the portion of the Creek Turnpike connecting Interstate Route 44 east and west of Tulsa, Oklahoma. Between Wichita Falls and Lawton, Interstate 44 follows U.S. 277 and U.S. 281. Northeast from Lawton to Oklahoma City, the H.E. Bailey Turnpike portion of I-44 follows U.S. 62-277. 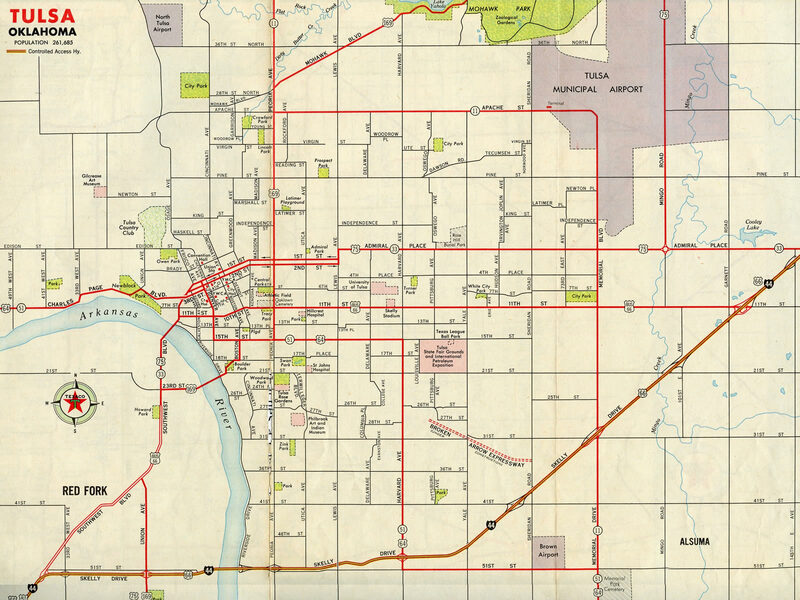 The remainder of Interstate 44 from Oklahoma City northeast to St. Louis, replaced famous U.S. 66, although much of that route survives as Oklahoma 66, Missouri 66 or Business Loop I-44. The relocation of Interstate 44 east of Tulsa at the Creek Turnpike (designated a future Interstate corridor) and U.S. 412 was approved by AASHTO on May 30, 2003. This included a new alignment for I-44 leading due south directly to the Creek Turnpike at U.S. 412. The angled portion of the Will Rogers Turnpike to SH 66 at U.S. 412 was abandoned, though ramps still link SH 66 east from I-44 east and from SH 66 west to I-44 west. State-named shield for IH 44 west posted after the North 8th Street on-ramp at Wichita Falls, Texas. U.S. 277 overlaps with Interstate 44 north to Randlett, Oklahoma while U.S. 281 runs concurrent with the freeway for 61 miles through Lawton. Photo taken 09/06/09. Interstate 44 follows Skelly Drive, the original expressway bypass of U.S. 66, between the Turner and Will Rogers Turnpikes across Tulsa. 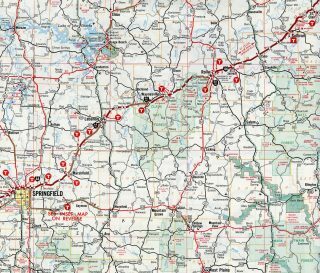 Construction for Interstate 44 directly upgraded several four-lane sections of U.S. 66 throughout the ShowMe State. 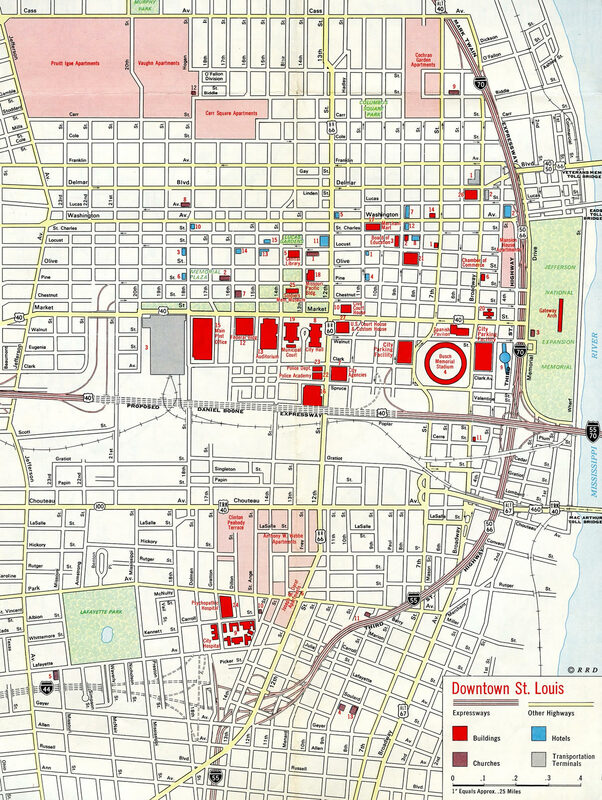 The eastern extent of I-44 proposed at I-55 and Lafayette Avenue in 1968 (the freeway was completed through St. Louis in 1972). Ramps were built here for the incomplete North South Distributor Freeway (Missouri 755). MO 755 was scaled back in the early 1980s and dropped as a parkway in 2003. 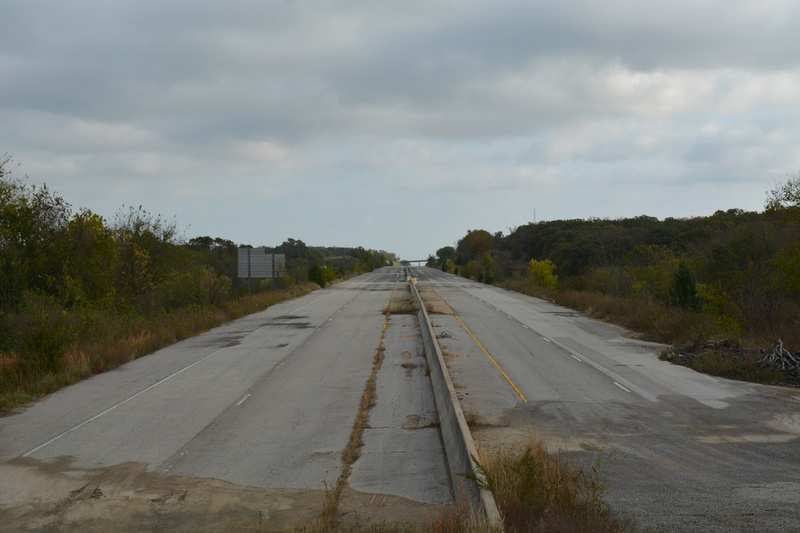 The abandoned section of the Will Rogers Turnpike east of Pine Street in Catoosa, Oklahoma. Photo taken by 11/02/16. Until 2013, the eastern terminus was previously thought to be located at the Illinois/ Missouri state line on the Poplar Street Bridge (Interstates 55/64/70 and U.S. 40) across the Mississippi River. With construction of the new alignment for Interstate 70 along the Stan Musial Veterans Memorial Bridge to the north, AASHTO approved a 2.9 mile northern extension of I-44 over former I-70, from I-55 at Truman Parkway to the west end of the cable-stayed bridge. Opened on February 9, 2014, the new span shifted Interstate 70 northward away from the Poplar Street Bridge and the trenched freeway stretch by the Gateway Arch. I-44 now travels the below-grade freeway that I-70 followed from the Poplar Street Bridge northward to the Stan Musial Bridge west end at Tucker Boulevard. Interstate 44 east leads directly into Interstate 70 west at the end of the Stan Musial Veterans Memorial Bridge in St. Louis, Missouri. Photo taken by Chris Kalina (03/08/14). An older end sign for I-44 east preceded the Compton Avenue overpass at the Compton Heights neighborhood of St. Louis. Photo taken by Rich Piehl (11/00). A sign for an Amtrak Station at Exit 290B took the place of this end I-44 assembly by 2014. Interstate 44 previously continued north along side I-55 as an unsigned route to the Poplar Street Bridge east. Photo taken by Jeff Morrison (04/19/08). Interstate 44 east at the off-ramp (Exit 289) for Jefferson Avenue north to Lafayette Square and south to McKinley Heights. The subsequent off-ramp to Lafayette Street is a remnant from the defunct Missouri 755 freeway loop proposed around the west side of Downtown St. Louis. Photo taken by Jeff Morrison (04/19/08). Interstate 44 concluded its three state journey as Exit 290B (Lafayette Avenue, former 18th Street exit) and Exit 290A (Interstate 55 south) departed towards their respective directions while the mainline transitioned onto I-55 northbound. Photo taken by Jeff Morrison (04/19/08). Interstates 55-64-70 and U.S. 40 combined west across the Poplar Street Bridge from East St. Louis, Illinois to Downtown St Louis, Missouri. Initial signs referenced the forthcoming TOTSO movements of I-70 west to Memorial Drive and I-55 south to Interstate 44 west. Photo taken 10/16/04. The Poplar Street Bridge carried four westbound lanes with no shoulders across the Mississippi River. Interstate 64 & U.S. 40 extend west from the left two lanes to Wentzville while back to back lane drops followed for I-70 west by the Gateway Arch and I-44 west / I-55 south. An arrow per lane (APL) sign is positioned here now. Photo taken 10/16/04. The original interchange at the Poplar Street Bridge west end separated departing traffic into narrow single lane ramps. Both were demolished in 2015-16 as part of the reconstruction of Interstate 44 (former I-70) north between the Gateway and Downtown. Photo taken 10/16/04. Exit 40C took the Interstate 55 mainline onto the below grade freeway extending south from then I-70 east and Downtown. This ramp was replaced by a new two-lane flyover in 2016. Photo taken by Brian Dowd (06/29/02). Interstate 55 angles southwest from the Poplar Street Bridge along a viaduct by the LaSalle Park community on the 0.75-mile approach to Exit 207 with I-44 west. Photo taken by Brian Dowd (09/28/02). Interstate 55 lowers to grade level by the Soulard community and curves west to the directional T interchange (former Exit 207) with Interstate 44 west. This stretch now uses exit numbers for I-44, with the mainline of I-55 assigned as left Exit 290B. Photo taken by Brian Dowd (09/27/02). Traffic partitioned with two lanes for the continuation of I-55 south to Cape Girardeau and Memphis, Tennessee and two lanes for the beginning of I-44 west to Rolla, Springfield, Joplin and Tulsa, Oklahoma. Photo taken by Brian Dowd (09/28/02). Heading north between the Kosciusko and Soulard communities, Interstate 55 approached the eft-hand ramps for both Interstate 44 west and Lafayette Avenue / Truman Parkway. 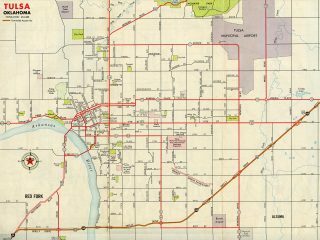 Had the Missouri 755 freeway been completed, it would have provided connectivity from I-44 east & 55 north to I-64 & U.S. 40 west and from vice versa. Photo taken by Brian Dowd (09/27/02). 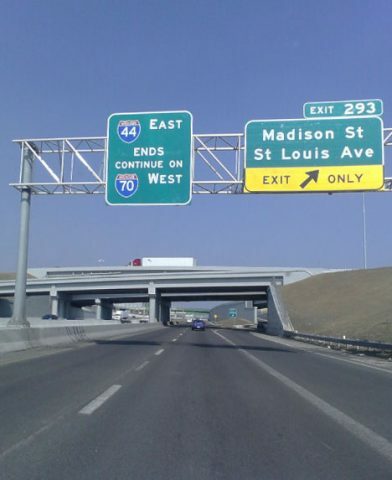 Older signs posted at Exit 207A omitted Missouri 30 for Gravois Avenue and Tulsa for Interstate 44 west. Subsequent changes renumbered the left-hand ramp to Exit 207B and replaced Truman Parkway for Lafayette Street. Truman Parkway was developed in place of the cancelled North South Distributor Freeway freeway. Photo taken by Brian Dowd (09/27/02). Taking left-hand ramp (Exit 207B) from I-55 north, motorists partitioned along a sharp curve for Interstate 44 west ahead of The Gate District and a two-lane ramp to Lafayette Street. Photo taken by Brian Dowd (09/28/02). The first reference of Interstate 44 from I-70 east appeared two miles ahead of the Poplar Street Bridge. Photo taken by Don Hargraves (02/14/03). Continuing south toward the Gateway Arch, Interstate 70 shifted from an elevated viaduct by the Eads Bridge to a below grade freeway leading directly to I-55 south. Photo taken by Don Hargraves (02/14/03). Passing below overpasses linking Downtown with Jefferson National Expansion Memorial, drivers passed below this diagrammatic sign out lining the TOTSO movement of Interstate 70 east onto the Poplar Street Bridge (I-55 north). The freeway mainline defaulted onto I-55 south ahead of I-44 west. Photo taken by Michael Summa (1981). 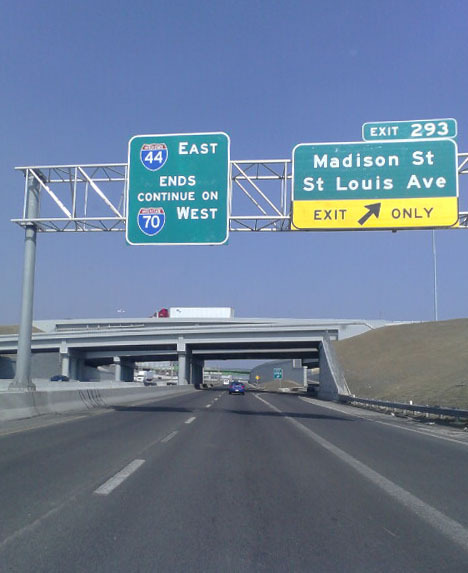 Later sign changes added I-64, reflecting the 1993 extension west across St. Louis, and the long distance cities of Tulsa and Memphis for I-44 west and I-55 south respectively. Photo taken by Don Hargraves (02/14/03). Interstate 70 turned east onto the Poplar Street Bridge to combine with I-55 north & 64 east to East St. Louis. I-55 south merged with unsigned I-44 through LaSalle Park. With Interstate 70 relocated away from the trenched section of freeway by Downtown, this ramp was eventually demolished. Photo taken by Don Hargraves (02/14/03). The final confirming marker for Interstate 44 west stands just south of the Central Freeway bridge across the Wichita River. Photo taken 09/06/09. U.S. 277 Business stems west from I-44 & U.S. 277-281-287 to run along the former alignment of both U.S. 82 and 277 to the Kell Freeway at Allendale Road. Exit 1 follows onto Holliday Street for 6th Street east into the Wichita Falls Business District. The overhead for Exit 1 was removed following the completion of the systems interchange with the Kell Freeway. Photo taken 09/06/09. Interstate 44 ends as the two-lane off-ramp (Exit 1) departs the Central Freeway south for Holliday Street (old U.S. 277-281-277 south). 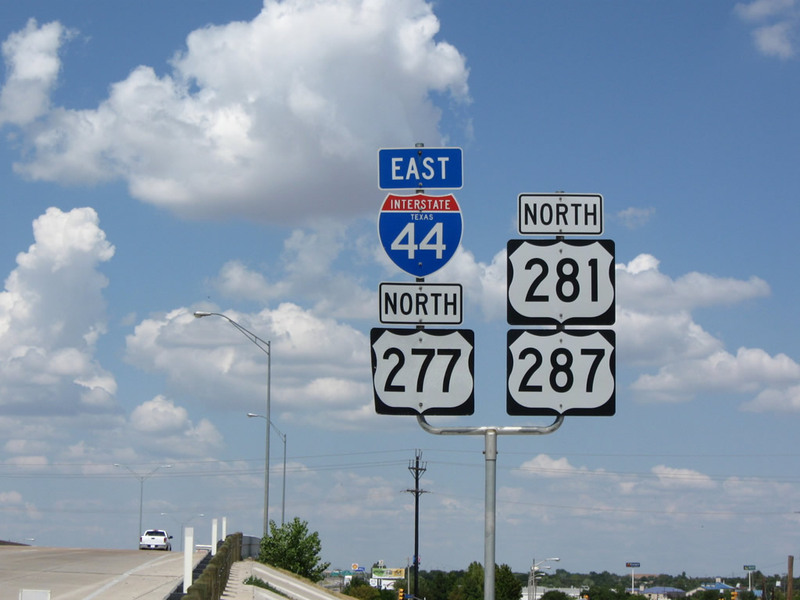 U.S. 277 splits with U.S. 281 & 287 toward Abilene at the ensuing exchange. Photo taken 09/06/09. U.S. 281 & 287 transitioned onto the Central Freeway viaduct above Holliday Street while U.S. 277 shifted onto the surface street south to Kell Boulevard and U.S. 82. Photo taken by Justin Cozart (09/02). U.S. 82 west separates with U.S. 281 & 287 north ahead of the Central Freeway viaducts and IH 44 to join U.S. 277 southbound along the Kell Freeway. First proposed in 1964, the Kell Freeway was completed with the opening of a 3.5 mile segment west from Fairway Boulevard to FM 369. Work on the $28 million final section ran from January 2008 to September 24, 2009.12 Photo taken 09/06/09. U.S. 277 combines with U.S. 281 & 287 (Central Freeway) north from the Kell Freeway. The trio elevate just west of Downtown Wichita Falls to the 6th Street off-ramp and the start of Interstate 44. Photo taken 09/06/09. Broad Street north passes by Bellevue Park ahead of 8th Street and the off-ramp for the eastbound beginning of IH 44. Photo taken 09/06/09. Milepost zero appears along the Broad Street ramp above 7th Street. The 6th Street flyover passes overhead from U.S. 277-281-287 (Central Freeway) north. Photo taken 09/06/09. The separate roadways of the Central Freeway converge ahead of 8th Street (U.S. 277 Business). Interstate 44 east and U.S. 277-281-287 proceed north 2.5 miles to the Northwest Freeway, where U.S. 287 branches west toward Vernon. Photo taken 09/06/09. An older overpass took U.S. 281 & 287 northward across a Forth Worth and Denver Railroad line and Kell Boulevard, 1.7 miles south of the IH 44 eastbound beginning. U.S. 82 west departed from an on-ramp here to join U.S. 277 (Kell Boulevard) south at FM 447. Photo taken by Jeff Royston (12/00). Shields posted along Broad Street north for IH 44 east and U.S. 277-281-277 north during the elevated freeway project. Photo taken by Jeff Royston (12/00). “Section of I-44 in Tulsa set to open over a month early.” Oklahoma DOT Public Affairs Media Advisory, August 01, 2003. INTERSTATE HIGHWAY NO. 44, Highway Designation File. Texas Department of Transportation. From Anywhere to Everywhere: The Development of the Interstate Highway System in Texas http://tti.tamu.edu/interstate_anniversary/white_paper/ by Penny Beaumont, Rhonda Brinkmann, David Ellis, Chris Pourteau, and Brandon V. Webb, Texas Transportation Institute, page 34. OK Turnpike Authority shutting down McDonald’s over I-44 for remodel, likely open in 2013. KJRH, March 26, 2013. “Iconic McDonald’s Set To Reopen Along Will Rogers Turnpike.” NewsOn6.com, December 17, 2014. Minutes For The Special Transportation Commission Meeting, Oklahoma Department of Transportation, March 10, 2014. “There’s no such thing as a ‘free highway'” Tulsa World (OK), September 16, 2002. “Only in Oklahoma: City bypass spawned suit, investigations.” Tulsa World, October 18, 2007. “Pike-bound lanes revised.” Tulsa World, July 11, 2002. “Central Freeway ready Road project comes to end seven months early.” Wichita Falls Times Record News (TX), May 10, 2002. “Kell job near done.” Wichita Falls Times Record News (TX), September 25, 2009. Page updated August 17, 2017.